One Million Unfilled Jobs in Tech! Say what? Last night I attended a screening of Code: Debugging the Gender Gap as part of the Reel Community Series at the Park City Film Series. Afterwards, I had the privilege of speaking as part of a panel that looked at the issues presented in the film, as well as discussing possible solutions. And boy do we need some solutions, and fast. 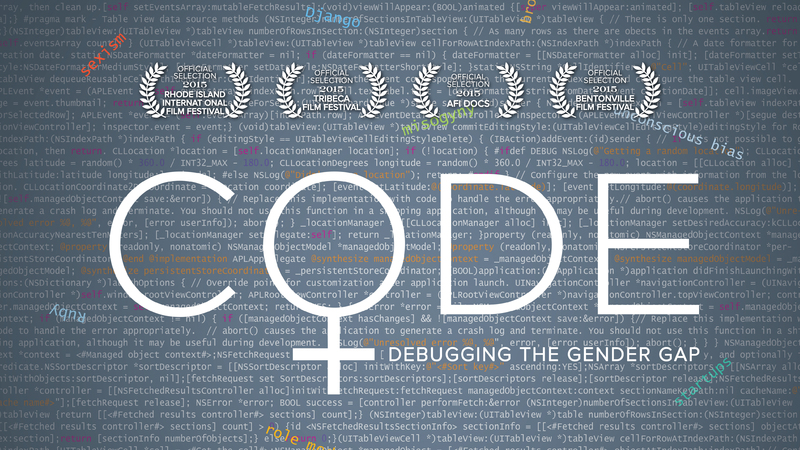 Code, a film by director Robin Hauser Reynolds, looks at the dearth of women studying and working in the Science, Technology, Engineering, and Math (STEM) industries, and examines the overt and subconscious gender biases and stereotypes that studies have shown are actively discouraging women from entering these fields. I knew that the numbers in this area were far from parity, but I wasn’t quite prepared for how shockingly low the statistics are for women in STEM. In some instances, they’ve actually gotten substantially worse over the past few decades. To give you an idea of where women stand in technology, here are some facts from Girls Who Code, an organization that works to close the gender gap in technology by offering free programs to educate, inspire, and equip young girls to pursue opportunities and careers in this field. Women today represent 18% of all computer science graduates. In 1984, they represented 37%. In middle school, 74% of girls express interest in STEM, but when choosing a college major, just 0.4% of high school girls select computer science. While 57% of bachelor’s degrees are earned by women, just 12% of computer science degrees are awarded to women. Despite the fact that 55% of overall AP test takers are girls, only 17% of AP Computer Science test takers are high school girls. The U.S. Department of Labor projects that by 2020, there will be 1.4 million computer specialist job openings. Yet U.S. universities are expected produce only enough qualified graduates to fill 29% of these jobs. Sadly, it’s not just the statistics that are depressing. Numerous reports and studies have come out in recent years that demonstrate that once women actually enter STEM industries, they face enormous challenges, including stereotypes, gender bias, and shockingly high instances of sexual harassment. A recent survey by Fortune Magazine of women working in the tech industry found that 60% of all respondents reported facing unwanted sexual advances at work, with 65% of these coming from superiors. In addition, 39% of those who had been sexually harassed didn’t report the harassment out of fear it would damage their careers. Another study that surveyed over 550 women scientists found systemic biases related to gender and race that immediately put women at a disadvantage from the moment they choose science as a career. Perhaps even more shocking is the discovery that these deep rooted unconscious gender biases are found in both men and women. A 2014 study, “How Stereotypes Impair Women’s Careers in Science“, discovered that both men and women were twice as likely to hire a man for a job that required math than hire a woman. Thankfully, technology is helping to solve this problem, and in fact, just last week I became one of many investors in a round of funding for Unitive, an app that seeks to help companies eliminate unconscious bias in their hiring processes. Though the statistics are shocking, but they are not irreversible. Organizations such as Girls Who Code and EngineerGirl, as well as educational toy companies such as GoldieBlox and Roominate, are working to ensure that young girls know that STEM careers are not just for the boys, while outreach programs and films like Code are working to educate the STEM industries and help them to become more inclusive. Companies who are large employers of coders can also do their part. The film featured the story of Etsy, which increased its number of female coders by 500% in just one year by using some very simple programs. Way to go! During the Q & A, an audience member asked, “What is the most important strategy for changing these outcomes?” One of the panelists focused on the issue of the pipeline and making sure we are encouraging girls to choose to study STEM. However, for me, the most powerful tool we have is our own pocketbooks. If we were to choose to not buy products or services from companies that do not demonstrate a commitment to workforce inclusion and diversity, things could change quite literally overnight. Thankfully, technology is helping us do that as well with apps like the BUYUP Index, but more of these tools cannot come fast enough. Aligning our pocketbooks with our values is, as I have said over and over and over again, the most underused tool we have to create positive social change. I encourage you to check out the screenings page for Code and request one in your area, especially for a local school! In today’s digital age, the lack of female representation in STEM affects us all, and it’s time we all did something about it. Next Post The 2016 Sundance Film Festival is Ready to Go!